Share the post "Papery Peep February 2016"
For today’s Papery Peep I thought I’d share with you my Open University study box, as it’s a pretty important bundle of paper in my life at the moment. I study out of a box, on our battered old kitchen table. I find that keeping everything that I need in one place like this makes studying more accessible. As soon as I grab that box and pop it on the table I am in the zone, I need to knuckle down! I do have other books that I’ve bought to read around the subject further, but I like to keep those in my bookcase, lest they distract me from focusing. So there you have it, my degree in a box! 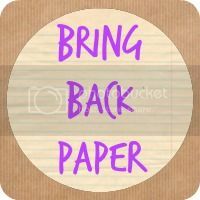 Bring Back Paper Pledge – A little update on how I’m getting on with my Pledge activities. So I wanted to read 4 books per month this year and I’ve read 6 books so far this month – My American Duchess by Eloisa James,The Sugar Queen by Sarah Addison Allen, Upon the Midnight Clear by Sherrilyn Kenyon, Recipe for Love by Katie Fforde, Denial by Peter James, The Queen of the Tearling by Erika Johansen, and I’m now partway through a thriller. I have really enjoyed the good mix that I’ve read, as I’ve deliberately selected a different genre after each book. I have also been pleased as I have enjoyed all of them, particularly The Sugar Queen and The Queen of the Tearling (am now frustrated as I have to wait for the next book in the trilogy!). I also managed to get to the library and two of these are library book reads, so I’m pleased that I’ve got back into that as it’s a handy way to save a little money when I know I’m unlikely to re-read the book and just give it away anyway. I spent a little time on my snail mail last week which means I can sit back and await lovely happy mail to come to me. My planner is all up to date and I find myself using it more and more. I have resisted any new stationery purchases, though that was helped by receiving a fabulous Pocket Notebook Box to review! I have even fit a little colouring in, as I sat and coloured alongside the kids over half term last week which was nice. So I think I’m pretty much where I need to be on my papery pledge. I’m particularly enjoying all of the books. Linky closes at midnight 1st March 2016. What paper have you been enjoying this month? That’s such a good way of having everything you need in one place for studying – am quite tempted to do the same as all of my things are a bit all over the place at the moment. Hope your studies are going well. What a pretty box. Brilliant idea for keeping relevant books together. Gone are the days of books just laying in a pile and students searching through them as they hurry off to a lecture. I spotted similar boxes in a supermarket and wanted to buy one – just because! It’s lovely, isn’t it? It is easier, and yes, I could not resist the box anyway! I’m really enjoying it all. Yes, sign up for something new. Ah, that must have been some time ago now! I have a draw like this in my desk full of Uni Work! It really helps you feel organised haha. I do know what you mean about working out of a box! As soon as it’s open you can get in the ‘zone’… lots of reading for you there Jocelyn. I still have no idea how you get through so much reading for pleasure or otherwise. You must be one speedy reader…!